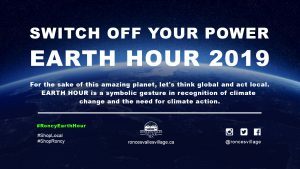 This year, Earth Hour, the event that recognizes Climate Change and the need for climate action, is being taken indoors to venues along Roncesvalles and Queen Street and further into Ward 4. 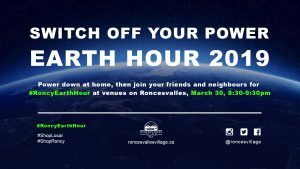 You can find all the businesses and shops along Roncy that are participating on our Facebook page or by heading to Earth Hour Ward 4 website. So, whether at home or joining in with others, we hope you will join us Saturday, March 30th from 8:30 p.m. to 9:30 p.m! Don’t forget to include #RoncyEarthHour in any photos or images you post (on Facebook, Twitter, Instagram) during and after the event.